The Atkins Diet slot machine was designed by Michael Shackleford, also known as the Wizard of Odds. He designed it for a 2008 Gaming Technologies Association conference in Australia, where he was invited to speak. The slot is loosely based on the Atkins Diet. This was a popular product in the 2000's that eliminated carbohydrates from a participant's diet. All of the symbols are items that are allowed under the diet program. 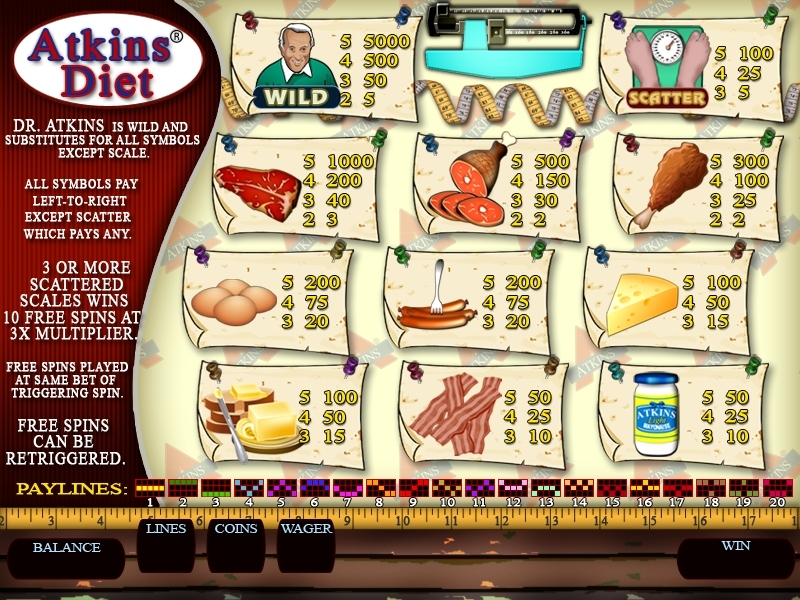 The slot is not available in any casino, nor is it associated with the actual Atkins Diet. It is simply a parody. 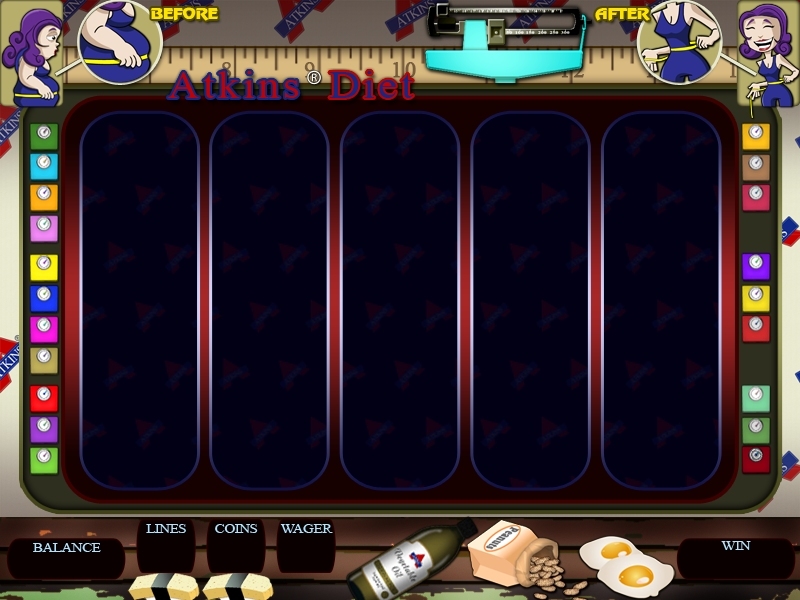 There are 20 pay lines on the Atkins Diet online slot machine. The maximum number of coins per line is 5. The max play is 100 coins per spin. There is a maximum bet button or you may choose how many lines and coins that you prefer to play. There is an auto spin feature for those that do not want to have to press the "Play" button on every spin. This is perfect for players that enjoy sitting back and watching the reels or prefer to change bets from one spin to another. Players may set the auto spin to stop on bonus rounds, free spins, or set win and loss limits. It may also be set on a maximum number of auto play spins before pausing. All of these will appear in the settings when "Auto Play" is chosen on the Atkins Diet slot machine. The Atkins symbol is wild and may be used with any other symbol with the exception of "Scattered", The Atkins symbol resembles a scale. Three or more scales will launch a special bonus round. The bonus round consists of ten free spins. All wins during the bonus round are tripled and awarded when all free spins are completed. Players start with 10,000 chips. The chips will reload if the screen is refreshed. A new chip stack will be offered if the chip balance reaches zero.